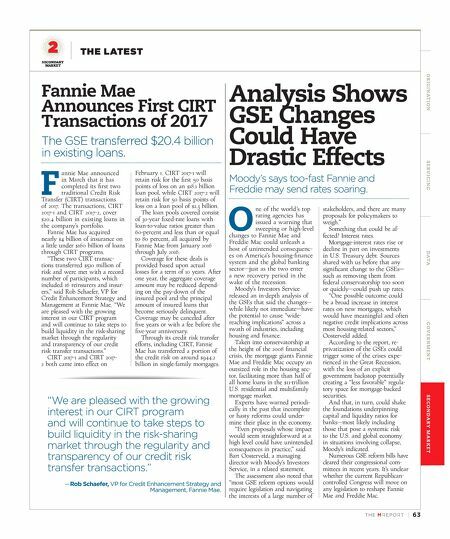 TH E M R EP O RT | 63 SECONDARY MARKET THE LATEST O R I G I NAT I O N S E R V I C I N G DATA G O V E R N M E N T S E C O N DA R Y M A R K E T Fannie Mae Announces First CIRT Transactions of 2017 The GSE transferred $20.4 billion in existing loans. F annie Mae announced in March that it has completed its first two traditional Credit Risk Transfer (CIRT) transactions of 2017. The transactions, CIRT 2017-1 and CIRT 2017-2, cover $20.4 billion in existing loans in the company's portfolio. Fannie Mae has acquired nearly $4 billion of insurance on a little under $160 billion of loans through CIRT programs. "These two CIRT transac - tions transferred $510 million of risk and were met with a record number of participants, which included 16 reinsurers and insur - ers," said Rob Schaefer, VP for Credit Enhancement Strategy and Management at Fannie Mae. "We are pleased with the growing interest in our CIRT program and will continue to take steps to build liquidity in the risk-sharing market through the regularity and transparency of our credit risk transfer transactions." CIRT 2017-1 and CIRT 2017- 2 both came into effect on February 1. CIRT 2017-1 will retain risk for the first 50 basis points of loss on an $18.1 billion loan pool, while CIRT 2017-2 will retain risk for 50 basis points of loss on a loan pool of $2.3 billion. The loan pools covered consist of 30-year fixed-rate loans with loan-to-value ratios greater than 60-percent and less than or equal to 80 percent, all acquired by Fannie Mae from January 2016 through July 2016. Coverage for these deals is provided based upon actual losses for a term of 10 years. After one year, the aggregate coverage amount may be reduced depend - ing on the pay-down of the insured pool and the principal amount of insured loans that become seriously delinquent. Coverage may be canceled after five years or with a fee before the five-year anniversary. Through its credit risk transfer efforts, including CIRT, Fannie Mae has transferred a portion of the credit risk on around $944.2 billion in single-family mortgages. "We are pleased with the growing interest in our CIRT program and will continue to take steps to build liquidity in the risk-sharing market through the regularity and transparency of our credit risk transfer transactions." —Rob Schaefer, VP for Credit Enhancement Strategy and Management, Fannie Mae. 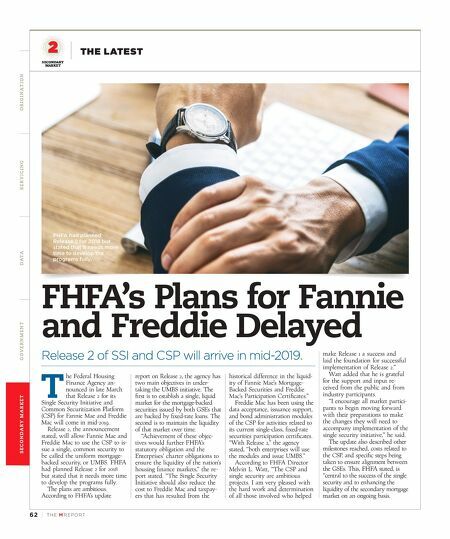 Analysis Shows GSE Changes Could Have Drastic Effects Moody's says too-fast Fannie and Freddie may send rates soaring. O ne of the world's top rating agencies has issued a warning that sweeping or high-level changes to Fannie Mae and Freddie Mac could unleash a host of unintended consequenc- es on America's housing-finance system and the global banking sector—just as the two enter a new recovery period in the wake of the recession. Moody's Investors Service released an in-depth analysis of the GSEs that said the changes— while likely not immediate—have the potential to cause "wide- reaching implications" across a swath of industries, including housing and finance. Taken into conservatorship at the height of the 2008 financial crisis, the mortgage giants Fannie Mae and Freddie Mac occupy an outsized role in the housing sec - tor, facilitating more than half of all home loans in the $11-trillion U.S. residential and multifamily mortgage market. Experts have warned periodi- cally in the past that incomplete or hasty reforms could under- mine their place in the economy. "Even proposals whose impact would seem straightforward at a high level could have unintended consequences in practice," said Bart Oosterveld, a managing director with Moody's Investors Service, in a related statement. The assessment also noted that "most GSE reform options would require legislation and navigating the interests of a large number of stakeholders, and there are many proposals for policymakers to weigh." Something that could be af - fected? Interest rates. Mortgage-interest rates rise or decline in part on investments in U.S. Treasury debt. Sources shared with us before that any significant change to the GSEs— such as removing them from federal conservatorship too soon or quickly—could push up rates. "One possible outcome could be a broad increase in interest rates on new mortgages, which would have meaningful and often negative credit implications across most housing-related sectors," Oosterveld added. According to the report, re- privatization of the GSEs could trigger some of the crises expe- rienced in the Great Recession, with the loss of an explicit government backstop potentially creating a "less favorable" regula- tory space for mortgage-backed securities. And that, in turn, could shake the foundations underpinning capital and liquidity ratios for banks—most likely including those that pose a systemic risk to the U.S. and global economy in situations involving collapse, Moody's indicated. Numerous GSE reform bills have cleared their congressional com- mittees in recent years. It's unclear whether the current Republican- controlled Congress will move on any legislation to reshape Fannie Mae and Freddie Mac.